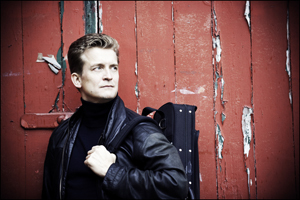 Ondine is pleased to announce a long-term recording collaboration with German violinist Christian Tetzlaff, internationally recognized as one of the leading soloists of his generation. November 2011 will see the international release of the first recording, with Frankfurt Radio Symphony Orchestra and Paavo Järvi, of violin concertos by Felix Mendelssohn and Robert Schumann, coupled with Schumann's Fantasy for Violin and Orchestra (ODE 1195-2). Chamber music will be the focus of two CD releases in autumn 2012 and spring 2013, which will include violin sonatas by Mozart and Schumann and feature Christian Tetzlaff's longtime piano chamber partner Lars Vogt. Further recordings are being discussed with Frankfurt RSO and Helsinki Philharmonic Orchestra. Reijo Kiilunen, Managing Director of Ondine, comments: "Christian Tetzlaff is one of the most outstanding violinists of our times and it is my great pleasure to welcome him to Ondine. I look forward to making recordings including repertoire upon which Mr Tetzlaff has built his legendary reputation. This long-term collaboration will benefit from the international Naxos Group expertise in physical and digital distribution."